Six students from Carlton Comprehensive High School proved Friday that they are some of the most skilled in Saskatchewan. 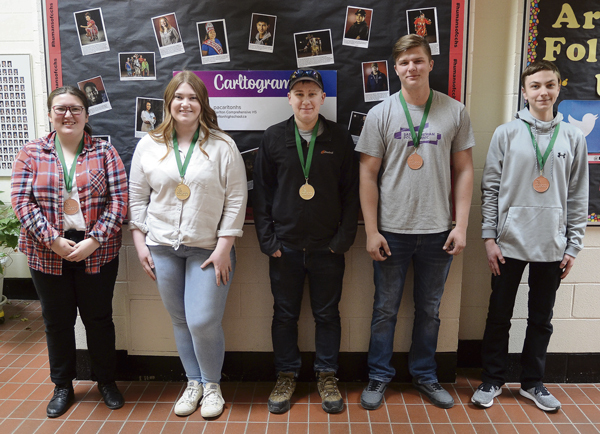 The school sent 16 students to the Provincial Skills Canada competition last week, and came back with six medals, including two golds. Those two students who won gold in their respective disciplines will now go on to the national Skills Canada competition in Halifax on May 28 an 29. At first, one of the winning students, Emily White, didn’t realize she had won. White comes about her talent naturally. Her mother and grandmother started their catering business, now Yellow Fender Coffee House and Eatery, when she was just six months old. She’s grown up around food. Friday, she took home top honours in the pastry and confectionary competition. “I grew up doing that kind of stuff,” she said. White baked an orange raisin loaf, six buns, raspberry lemon cream puffs and chocolate orange almond shortbread cookies. She also decorated a cake. She credits her success, in part, to her teacher, and her family, who helped her elevate her skills from her fifth-place finish last year. While she will probably keep baking as a hobby, White doesn’t see herself pursuing pastry as a career. Still, she’ll take the win. “It feels pretty good,” she said. In contrast, for Nicholas Doucette, his skill is something he wants to do for the rest of his life. Doucette won the gold for precision machining or making metal parts on a lathe. The practice is used commercially to make parts for other matches, and for other industry work. Doucette just edged out another Carlton student, Jesse Hamm, who took home the precision machining silver. Doucette discovered machining in shop class and hasn’t looked back. For the challenge, the students had to create a part that showed what they could do. Doucette said machining is something he intends to do after high school. Like Doucette, Hamm hopes to continue to pursue machining. “I picked up machining because I love working with my hands,” Hamm said. Hamm said he enjoys machining “big time. Carlton’s two bronze medal winners also hope to keep practicing the skills they demonstrated in Saskatoon. Kelly Lam loves reading and writing and wants to become a teacher. She competed in prepared speech. She had to prepare a speech and give an answer to two questions in s straightforward, professional way. “ I want to be a teacher, so this seems like it would be a pretty valuable asset.” Lam, who won silver last year, is hoping to return to the competition in 2020. “Next year I’m going for gold to get the whole set,” she said. Similarly to Lam, Cole Bear won bronze with a skill he hopes to use in his planned career. Bear took home his medal for Mechanical CAD (Computer Assisted Drafting). “It’s like engineering,” he said. “You measure a part and then build it with 3-D modelling. Bear was tasked with designing a paint sprayer nozzle, which he said was much harder than anything he had done while training. Bear said he’s really into engineering and is already doing what he needs to in order to pursue that as a career path. Carlton’s sixth medalist, Theoren Chamberlain, won silver in autobody repair. He wasn’t available for an interview with his fellow competitors Tuesday because he was at work. Teacher Brad Amy said that in addition to the six meals several students earned fourth place finishes. He said the competition gives students a good taste of some of the options they have for future careers. “A lot of the kids we took, especially this year, are looking at it as a career option,” he said. These competitions are a good notch in the belt, he continued. For those who won provincials, nationals will be a big step up, competing against 10 other provincial and territorial winners in a bigger, two-day contest. From there, Canadian winners can go on to worlds. About six years ago, Amy said, a Canadian won the world competition. Amy, who works with the skills program, said that more students are starting to look at skilled trades as options after graduation. “Some kids are a square peg in a square hole. They take it and run with it. By the time they’re in Grade 11 or 12 they take our apprenticeship class, get out and start working right in the trade” he said.